& from United States including Hesperia. The rear of the sleeve shows a black and white early Seventies image of the band incorrectly showing Mick Taylor [who does not appear on the album] instead of one with Brian Jones [who does]. Below the image is the title and tracklisting, with other albums issued by the book club and along the bottom the text 'Fono-Ring Im Christophorus-Verlag Freiburg Im Breisgau' with the catalogue number. The book club Fono-Ring was far smaller than that of the Bertelsmann Club or Hör-Zu, making this a record that is almost impossible to find these days and which is known to have been counterfeited. This is a genuine first issue copy with stamped matrices which both start 'ZAL' in the run off areas. Though it is not known exactly how many of these sleeves were produced it is believed that fewer than 100 were sent out, making this a highly sought after collectable indeed. The vinyl remains in excellent condition with the track breaks near silent and it has obviously not been excessively played. There no marks around the spindle hole & the Red Decca Sonderauflage labels are free from writing and other blemishes so often found on European records of this age. The all important picture sleeve is in remarkable condition despite being made from very thin paper stock. It is free from writing and has stood the test of time very well. There is just a little light shelfwear evident with some minor age yellowing to the mostly white back. There is a little scuffing & a small tear at the opening, but nothing much else to show for its forty years. A true rarity in far better than usually found condition, on a par with and rarer than the 1965 Beat Beat Beat 10" LP. Have You Seen Your Mother Baby, Standing In The Shadow? 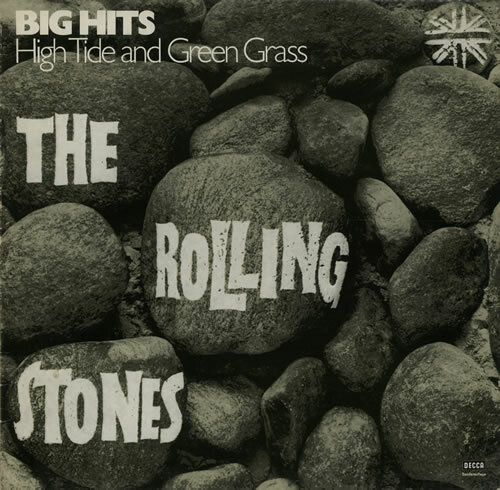 Product Information Rolling Stones Big Hits - High Tide and Green Grass Germany vinyl LP album (LP record).